Be sure to watch the video at the end of the photo gallery to see the true setting of the Tides Cottage. The Tides Cottage is waterfront gem located 3 miles to down town Southwest Harbor on the quiet side of MDI. There are several entrances to Acadia nearby, Seawall, Wonderland and Ship Harbor to name a few. Our Cottage has a heat pump providing electric heat or cooling on those hotter days. There is a wood burning stove and wood is provided. The vaulted ceilings, white washed pine walls and a glass front make the living area very spacious, and the perfect place to watch the changing of the tides. Towels and bedding are provided for the 2 bedrooms and sleep sofa. We are on the western side of Mount Desert Island, home of Acadia National Park. 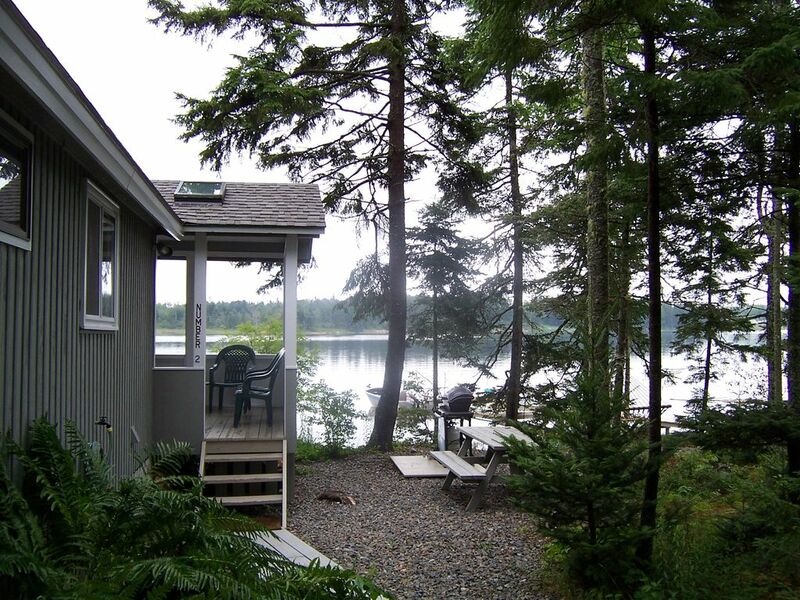 There is a shared dock with two other cottages, row boat, and kayak at the water's edge for use of our guests. Tides has a gas grill, picnic table and hammock for outside relaxing. Back Beach, for exploring what the sea left behind, and Thurston's Wharf ,a restaurant out over the harbor, are within a mile from the cottage. All of Acadia is just a few minutes away from this peaceful spot and the call of the loon is a memory you won't soon forget. We will be happy to arrange a ride on one of the whale watching ships or furnish the refrigerator with bread, milk and the essentials so you don't spend your time shopping for groceries when you can be exploring Acadia and enjoying fresh Maine Lobster. Take in all the sights and sounds of Acadia National Park. Explore the natural beauty and adventure on your own or join in one of the many Ranger talks and guided tours. Take a carriage ride or bike Cadillac Mountain. Relax on the deck or in the hammock. Take the free Islander Shuttle and visit Jordan Pond Tea House and the Oceanarium. Bike Acadia! : Enjoy all of the activities of Mt. Desert Island - Hiking, fishing , bicycling on carriage roads, kayaking on lakes and ocean, visiting museums and a lighthouse, whale watching, shopping, dining at lobster pounds and restaurants, sailing, and riding ferries to outer islands. Visit Bar Harbor and watch a world class cruise ships come in to Frenchman Bay. We purchased 2.5 acres on Bass Harbor in 1974 and built our home and the cottages in the following years adding upgrades and renovations almost yearly. We are native to Mount Desert Island, have 2 grown children and 4 almost grown grandchildren. We enjoy boating the Maine coast, kayaking the local waters and walking the trails of Acadia. This cottage is all wood, no smelly carpets, is located right at the water's edge on Mill Creek off Bass Harbor and is only 3 miles to down town Southwest Harbor and 20 minutes to down town Bar Harbor. Entrances to Acadia are all around us. Sitting in the swing at the water's edge with morning coffee and again at the end of the day is a peaceful start and ending to every day..
We had a great time at the Tides Cottage. It was truly amazing to literally watch the tides change throughout the day. This is a great area for hiking and sightseeing. Bar Harbor, good shopping/eating and Cadillac Mountain are a short drive away and provide great scenery. My wife and I loved drinking our coffee and watching out the large front windows overlooking the water. We would highly recommend the Tides Cottage! Fantastic spot. Very clean. Perfect for four. Had a great time. Very clean, comfortable cottage. Perfect place to watch the tides come and go. Close to BarHarbor and a short drive to Bass Harbor Head Light and Seawall. Wish we would have had longer to stay at this beautiful place. Loved eating at SW and Bass Harbor restaurants! Outstanding amenities and cleanliness! Loved its proximity to Southwest Harbor! The owners have provided everything a visitor could possibly need! The wooded setting on the harbor was lovely! Gorgeous views were enjoyed indoors through a wall of windows and outdoors on a deck furnished as comfortably as a living room! The five star rating also reflects the cleanliness of the house—-kudos to housekeeping staff! Enjoyed use of the kayaks, canoes, and rowboat ! Life jackets were also provided. Loved being 30 minutes from Bar Harbor since my husband and I cherish the moments on the “quiet side” of MDI! We have it all. . .Biking, beaching, hiking, canoeing, kayaking, whale watching, fishing, fine dining, shopping, museums, movies, live music, bird carving, art, festivals,etc., etc., etc. And fresh lobster. Nearest Mall is 30 minutes in Ellsworth!